A big step forward for LinPlug's powerful synth/sampler, which now sounds and works better than ever. Powerful synthesis engine. Much better layout than CronoX 3. Good price and loads of presets. Load your own samples. Improved sound quality. Not great at certain types of sounds. It's over five years since we reviewed CronoX 3, and CrX4 (VST/AU/RTAS) marks not only an upgrade for LinPlug's sampling synth but also an architectural rebuild and visual redesign. The result is, basically, a whole new instrument, drawing very heavily on its predecessor, with considerable - though not 100% - backwards compatibility. "CrX4 marks not only an upgrade for LinPlug's sampling synth but also an architectural rebuild and visual redesign"
The fundamental four-generator, two-filter design is the same as before, offering three sample-based sources (Time Sampler, Wavetable and Loop Sampler), a flexible analogue-modelled oscillator, plus a new noise generator. The filters still feature both the regular and continuously adjustable Free Filter options, but they can now run in either parallel or serial configuration. You get five dedicated envelopes (global amplitude, individual amplitude for Generators 1 and 2, and one for each filter) and a freely assignable one, as well as four LFOs with nine shape options. 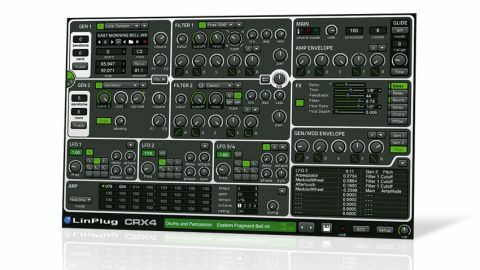 CrX4 includes the familiar LinPlug modulation matrix, with ten slots connecting 23 mod sources to 68 destinations. Of the generators, Time Sampler is the most complex, using a single-source triggered sample but with real-time and modulatable timestretch. Wavetable uses a source sample to generate a wavetable, with adjustable wavetable speed (25% to over 1600%). Loop Sampler is more like a typical sampler, with editable waveform, playback looping and up to 64 sample slots. Finally, the Oscillator offers a blend between full sawtooth and full pulse waveforms and overall shape/symmetry control. Clicking on either a category or patch name at the bottom opens the full-screen browser. We counted 18 categories, and well over 1000 patches in total. This is impressive stuff, and the categories have sensible names like 'Moving sounds' and 'Sequence sounds' alongside the more obvious 'Basses', 'Pads', etc. "LinPlug has thrown in some really clever operational touches, such as copy and paste between modules"
Patches generally use a combination of generators (Time Sampler plus Oscillator, say), and often you'll find sample-based generators used to add character or beef up simpler oscillator-based sounds. Loading your own samples (WAV or AIFF) expands your options. LinPlug has thrown in some really clever operational touches, such as copy and paste between modules, five-voice unison (Spread) on all but the Loop Sampler, and phase shape controls for fine-tuning the slope of the envelope stages. You can also cross-modulate Generators 2 and 4 from 1 and 3 respectively (either amplitude or frequency). A four-part indicator next to the preset name shows which of four main MIDI controllers are currently patched in (mod wheel, pitch wheel, velocity and after-touch), and there's also a very cool modulation-only setting for the arpeggiator. The upshot of all this is that although there are some 'stock' sounds in its preset library, CrX4 definitely leans more towards the creative. Sonically, it's more digital than analogue in flavour, and the sheer flexibility of the modulation system combined with the super-fast LFOs (up to 275Hz) only emphasises this further. Overall, CrX4 sits somewhere between a typical sample-based synth and a virtual analogue one, making it an excellent and affordable companion synth.